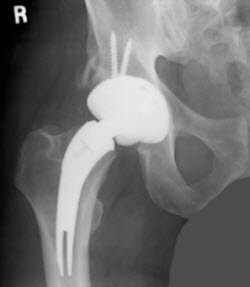 A male patient presents with severe and constant pain in the right hip 3 years after a hip resurfacing arthroplasty. With his metal ion levels climbing and an MRI showing evidence of fluid accumulation in the hip, he opts for revision arthroplasty. Over the last 15 years, patients worldwide have been attracted to modern hip resurfacing arthroplasty (HRA) with a metal-on-metal articulation has due to its potential benefits of high activity level and bone preservation. Good mid-term results have been reported, especially in male patients. However, there is now a need for revision options for a subset of patients who require early revision for unanticipated adverse local tissue reaction (ALTR) associated with the metal-on-metal articulation. 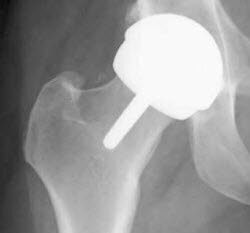 We present a case of HRA conversion to total hip arthroplasty (THA) using a neck-sparing THA component. A 42-year-old male presented to another facility with a 1-year history of progressive right hip pain, right hip stiffness, and irritability. Physical examination and radiographs showed degenerative changes of the right hip. He had inadequate relief with non-operative measures and subsequently underwent uncomplicated right HRA in 2008. He initially had good relief of pain and returned to an activity level that included heavy lifting and manual work. In 2010, he began to experience right groin pain and hip aching with high levels of activity. AP and lateral radiographs showed no loosening, osteolysis, fracture, or avascular necrosis at routine follow up. Cobalt blood levels were obtained serially, and were initially reported at 10-11 mcg/L. Subsequently, the levels rose to the range of 19-23 mcg/L. Metal artifact reduction sequence MRI was obtained in June 2011 and was interpreted as showing wear-induced synovitis and distension of the pseudocapsule with fluid collection but no overt tissue destruction. On presentation to our facility later in 2011, the patient reported extremely severe and constant pain in the right hip. His gait was notable for a mild limp, right hip irritability, and stiffness. AP and lateral radiographs of the right hip showed well-fixed resurfacing components and no osteolysis. The cup abduction angle was 43 degrees on AP film. Anteversion was measured at 32 degrees on cross-table lateral radiograph (Figure 1). Figure 1. Radiographs of the right hip HRA: AP (top left), cross-table lateral (top right), frog lateral (bottom). In September 2011, he elected to proceed with right hip revision arthroplasty in light of increasing hip pain, rising metal ion levels, and MRI evidence of fluid collection with synovitis. The femoral neck was osteotomized at the base of the resurfacing component with easy component extraction. The resurfacing acetabular component was removed with minimal bone loss and without complication. A 60-mm, multihole ingrowth shell was placed with three screws. The femoral side was reconstructed with a neck-sparing, modular stem. An alumina ceramic-on-ceramic bearing was used. Culture of the fluid was negative for infection. Many patients and surgeons have favored HRA in the last 15 years for the benefit of bone preservation. Young patients, especially, have elected HRA with the idea that they would have more proximal femur in the case of revision, and that revision to THA could be accomplished with primary THA components when, after many years, their HRA had failed. With greater understanding of HRA designs, metallurgy, component positioning variables, local soft tissue reactions, and the market recall of an HRA system, surgeons are faced with a group of young patients requiring revision of HRA to THA. Bone preservation is still of vital interest, even if HRA revision is required. A neck-sparing THA design can accomplish the goals of removing the metal-on-metal bearing, providing an alternative advanced or standard bearing, and preserving femoral neck bone for later reconstruction. In our case, the neck osteotomy was performed immediately at the base of the HRA femoral component. Preparation of the femur was identical to that of a primary THA with this device. No additional bone resection was required, and the option of future reconstruction with a standard primary THA device was retained. Proximal femoral offset and leg length were properly reconstructed, as shown in the postoperative radiograph in Figure 2. The implant shows good integration at 1-year follow up. Figure 2. Radiograph of the right hip following surgery. 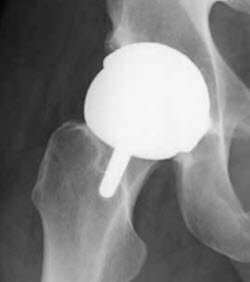 A neck-sparing femoral implant can be easily employed in HRA revision to THA, thereby retaining the HRA benefit of bone preservation that is vital to younger patients. John Keggi, MD, is an orthopaedic surgeon from Orthopaedics New England, Middlebury, Connecticut. Keggi J. 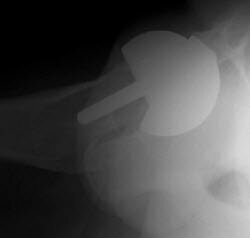 Revision of Hip Resurfacing Arthroplasty to Neck Sparing “ARC” Total Hip Arthroplasty – a case report. Reconstructive Review, a publication of the Joint Implant Surgery and Research Foundation (JISRF). 2013;3(1)52-54. Copyright 2014 John Keggi, MD. This work is licensed under a Creative Commons Attribution-NonCommercial 4.0 International License.